Today I found some green, pointy hyacinth leaves coming up out of the soil in our backyard. They were in a place I had forgotten about completely. I carefully cleared away some of the debris that was covering the tender new leaves so I could more clearly see them, imagining what they would look like in each stage of growth, all the while relishing the feeling of dirt under my finger nails. Spring is such a lovely time of year, even when it takes its sweet time getting here. The weather may not be all that spring-like just yet, aside form a day or two here and there, but I'm starting to incorporate more seasonally appropriate food into our rotation. 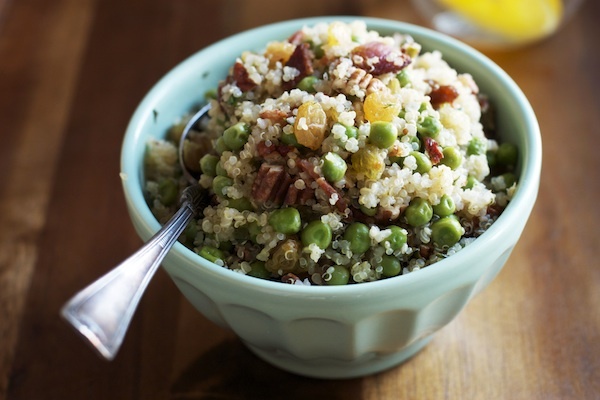 This quinoa salad, studded with bright green sweet peas, salty bacon, and sweet golden raisins is perfection. It was kind of an everything-but-the-kitchen-sink kind of concoction, but it turned out so well. I made a flavorful and bright dressing with lemon zest, lemon juice, olive oil, and lots of fresh herbs to bring even more freshness. It's been a delicious lunch this week and I know I'll be making various versions of it in the future. I've been trying to incorporate more grains into my diet that aren't in the form of macaroni and cheese (the little man's favorite) or rice bowls (a family favorite). This is a step in the right direction, yes? Another plus is that this is added sugar free! Perfect for anyone who has gone through (or plans to sign up for) this Go Sugar Free Course. Just a reminder- you have 5 more days to register as an Early Bird for GSF. Click here if you're interested! So, I'm going to continue watching my hyacinth (and tulips) grow and eventually bloom as a reminder that all good things come to those who wait. Spring included. Want something you don't have to wait for? This recipe. Put 2 cups of water in a saucepan and bring to a boil. Cover the pan, reduce heat so the water is just simmering, and cook until the quinoa is tender, about 15 minutes. Add the peas to the pan and stir with the quinoa. Cover and cook another 5 minutes. Transfer the quinoa to a large bowl. In a small bowl, combine the lemon zest, lemon juice, olive oil, parsley, basil, dill, and chives. Season with salt and pepper. Stir to combine. Pour the dressing over the quinoa. Add the bacon, raisins and chopped pecans and toss to coat. Serve warm, at room temp, or cold from the fridge.